The first trailer for Shakespeare Live! has been posted online. David Tennant Treat 4 Today. 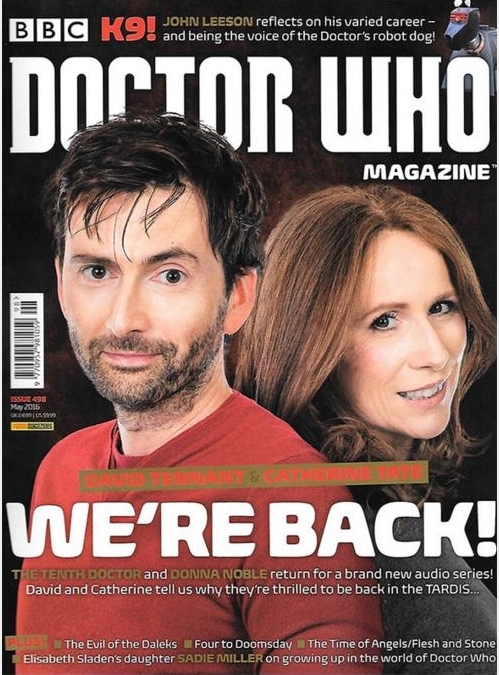 Doctor Who Magazine has posted an extract from the David Tennant / Catherine Tate interview which was published today. The second lottery for $30 on-stage seats opens at midnight to see David Tennant in Richard II. A great (old) photo of David Tennant has been posted to Twitter. Doctor Who Magazine issue #498 is published today with David Tennant on the cover. David Tennant Daily News Digest for Wednesday 30th March 2016 (7 items). A new photo of David Tennant from Mad To Be Normal has been posted to Twitter. Tickets for the David Tennant and Matt Smith panel at Wizard World NYC are now on sale. The Stage has a competition to win a copy of the King And Country DVD boxset. King And Country DVD boxset (released including David Tennant in Richard II) to be released on Friday (1st April). The clip of David Tennant talking about Hamlet (which we posted on Monday) will be broadcast tonight on Front Row on BBC Radio Four at 7.15pm. David Tennant Daily News Digest for Tuesday 29th March 2016 (4 items). Video of Teenage Mutant Ninja Turtles episode ten (which plays worldwide) has been posted to Break.com. The satellite television channel W (formally Watch) starts a repeat run of the David Tennant's episodes of Doctor Who from Sunday 10th April. David Tennant Daily News Digest for Monday 28th March 2016 (3 items). MP3 of David Tennant discussing Hamlet as part of Shakespeare's People on Front Row. David Tennant Daily News Digest for Saturday 26th and Sunday 27th March 2016 (10 items). David Tennant is on the cover of Doctor Who Magazine #498 which is published on Thursday (31st March). Doctor Who streams in the US again from today on Amazon Prime including the David Tennant era (but not his Specials). Video of David Tennant signing autographs for fans after Richard II on Thursday in New York has been posted to YouTube. New episode (Season Four, episode ten) of Teenage Mutant Ninja Turtles premieres today in US. Jessica Jones and Kilgrave to be made into Pop! Vinyl figures. Radio Times included David Tennant in 11 OMG moments to celebrate 11 years today since Doctor Who returned. David Tennant Daily News Digest for Friday 25th March 2016 (4 items). 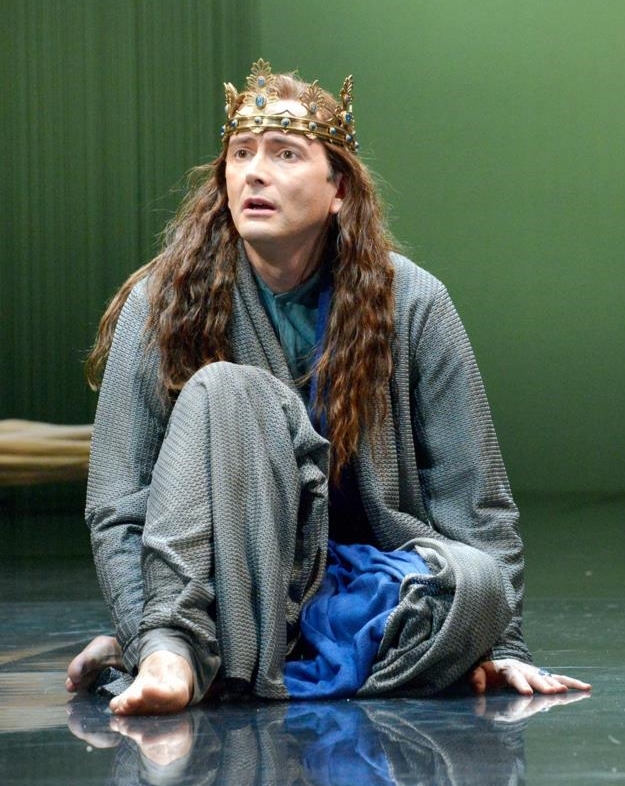 Audio of the David Tennant / Jonathan Slinger talk about Richard II from January. The first photo of David Tennant at the stage door last night has been posted to Twitter. David Tennant Daily News Digest for Thursday 24th March 2016 (5 items). Unfortunately Matt Smith has canceled his appearance at Wizard World Madison in April. The Brooklyn Academy Of Music (BAM) have added a King And Country promo video to YouTube which includes scenes from Richard II. David Tennant makes his American stage debut tonight when he performs Richard II at the Brooklyn Academy Of Music (BAM) Harvey Theater in the US at 7.30pm. David Tennant Daily News Digest for Wednesday 23rd March 2016 (8 items). A great photo of David Tennant in New York today with a fan has been posted to Twitter. David Tennant and Billie Piper will now hold a panel together at Wizard World St Louis in April. It was previously announced that they would hold separate panels. The first lottery for $30 on-stage cushion seats for Richard II opens at midnight. A new (to us) photo of David Tennant has been posted to Twitter. Doctor Who: The Tenth Doctor Archives Omnibus: Volume 1 is also published today. Doctor Who: Adventures With The Tenth Doctor Year Two Issue #7 comic is published today. David Tennant Daily News Digest for Tuesday 22nd March 2016 (4 items). Unfortunately Krysten Ritter has cancelled her appearance at Wizard World St Louis (she already cancelled Madison too). It also seems that Mike Coulter will no longer appear. The Doctor Who / Tenth Doctor book In The Blood will be published on Tuesday 6th December in the US. David Tennant Daily News Digest for Monday 21st March 2016 (4 items). The cover of the new Doctor Who / Tenth Doctor book In The Blood has been revealed. Variety has reported that Doctor Who will stream in the US exclusively on Amazon Prime (including the David Tennant episodes) from Sunday 27th March. This is since they stopped streaming on Netflix at the end of February. David Tennant Daily News Digest for Friday 18th to Sunday 20th March 2016 (8 items). David Tennant's birthday and how to get an autograph / signed photo. David Tennant Daily News Digest for Thursday 17th March 2016 (6 items). Doctor Who: The Tenth Doctor Adventures: 10th Doctor Audio Originals Audio CD cover has been posted to Twitter. Time Out has a new interview with David Tennant about Richard II (and Broadchurch). David Tennant will perform in Look Back In Anger with Sir Ian McKellen on BBC Radio Four in April and also David will host an episode of Archive On 4 about the play. Jane Austen BBC Radio Drama Collection is released on both CD and digital download today. David Tennant Daily News Digest for Wednesday 16th March 2016 (5 items). The Escape Artist has its French language premiere in Canada in August. New David Tennant interview in The New York Times about Richard II. The interview includes two new photos of David. Doctor Who: The Tenth Doctor Archives Omnibus Volume 3 to be published in June. David Tennant Daily News Digest for Monday 14th and Tuesday 15th March 2016 (6 items). Video of episode nine of Teenage Mutant Ninja Turtles which plays worldwide has been added to Break. Video of Saturday Night Takeaway which plays worldwide has been added to Break. David Tennant Daily News Digest for Sunday 13th March 2016 (5 items). A new photo of David Tennant with Craig David on Saturday Night Takeaway last night has been posted to Twitter. Saturday Night Takeaway with David Tennant last night obtained a 30.8% share (6.4 million) in the overnights. A new episode of Teenage Mutant Ninja Turtles premieres today in the US. This is episode nine of Season Four and is titled The Cosmic Ocean. David Tennant Daily News Digest for Friday 11th and Saturday 12th March 2016 (13 items). Photos of David Tennant on Saturday Night Takeaway tonight. Video of David Tennant playing Read My Lips on Saturday Night Takeaway has been posted to YouTube (UK only). A gif of David Tennant having seating problems on Saturday Night Takeaway has been posted to Twitter. More photos of David Tennant on Saturday Night Takeaway have been posted to Twitter here and here. A photo of David Tennant taking a selfie on Saturday Night Takeaway has been posted to Twitter. 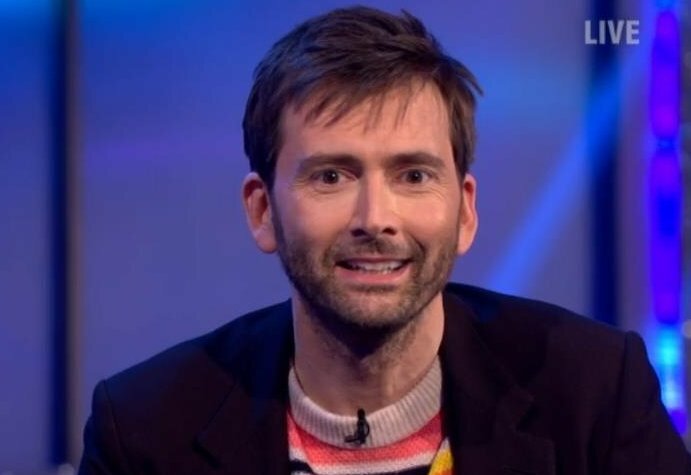 A gif of David Tennant in the Guest Announcer's booth on Saturday Night Takeaway has been posted to Twitter. The first photo of David Tennant on Saturday Night Takeaway has been posted to Twitter. David Tennant is the guest announcer on Saturday Night Takeaway on ITV tonight at 7pm. David Tennant Daily News Digest for Tuesday 8th to Thursday 10th March 2016 (11 items). $30 on-stage cushion seat tickets to be available via lottery for David Tennant in Richard II in the US. David Tennant adds Sunday to his appearance at Wizard World Madison in April. A German dubbed trailer for The Politician's Husband has been posted to Twitter. A French dubbed trailer for The Politician's Husband has been posted to Twitter. The Politician's Husband premieres in France and Germany tonight. David Tennant Daily News Digest for Sunday 6th and Monday 7th March 2016 (7 items). 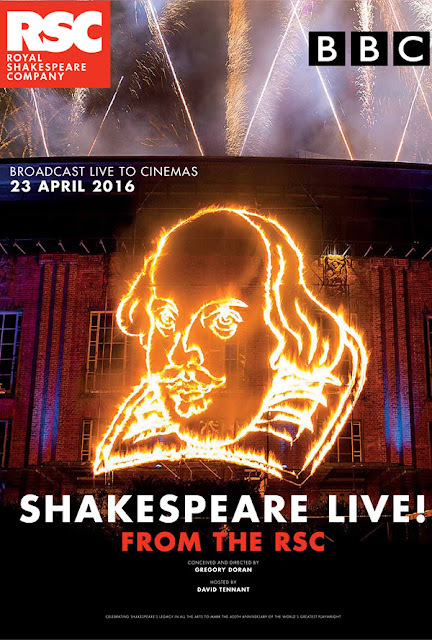 Cinema tickets for Shakespeare Live! (hosted by David Tennant) at cinemas in the UK are now on sale. The cinema screening starts at 8.15pm and has a run-time of 135 minutes. Pets - Wild At Heart won two awards at the Royal Television Society Bristol annual awards ceremony. The two awards were for Composer and Editing. David Tennant returns in a new episode of Jake And The Never Land Pirates at 8am on Disney Channel today and repeated at 8pm on Disney Junior US. David Tennant Daily News Digest for Saturday 5th March 2016 (3 items). David Tennant will be a guest on Saturday Night Takeaway next week on ITV. David Tennant Daily News Digest for Friday 4th March 2016 (5 items). New photos of David Tennant recording Carmilla last October have been posted to Twitter. Krysten Ritter will now no longer appear at Wizard World Madison in April. She is still attending St. Louis which includes dual photo ops with David Tennant. Shakespeare Live! (hosted by David Tennant) to be broadcast live to cinemas in the UK and Europe. David Tennant Daily News Digest for Thursday 3rd March 2016 (8 items). A screengrab of David Tennant on the set of Mad To Be Normal has been posted to Twitter. 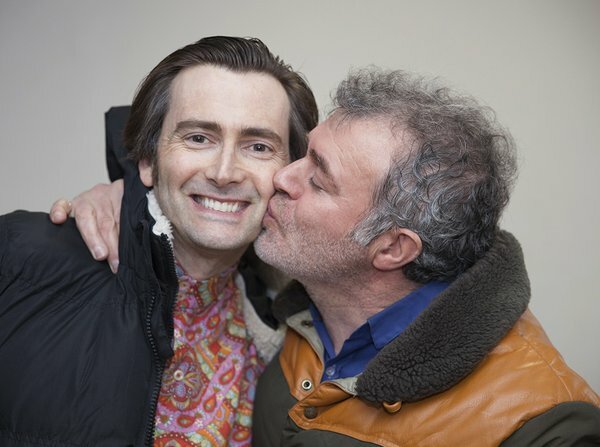 A fun photo of David Tennant with the director of photography on Mad To Be Normal has been posted to Twitter. David Tennant Daily News Digest for Tuesday 1st and Wednesday 2nd March 2016 (8 items). A photo of David Tennant from the Peter And The Wolf recording has been posted to Twitter. Final voting for the 2016 Anglophile Awards is open. David Tennant has been nominated for 2 awards - Best Actor In A Television Series (for Broadchurch) and Favourite British Artist Of The Year. Voting ends at 8am (UK time) on Friday 1st April. The first trailer for David Tennant in the three new Big Finish Doctor Who audiobooks has been posted to SoundCloud. Filming wrapped on Mad To Be Normal yesterday. David Tennant took cupcakes for the cast and crew! David Tennant Daily News Digest for Sunday 28th and Monday 29th February 2016 (5 items). The main aim of David_Tennant@Twitter is to post information about the actor David Tennant. If you repeat the information online it would be appreciated if you could post that you read it first on DavidTennantOnTwitter.com, just as we are always careful to give full credit.